What if we told you that we could give you a more beautiful smile in just one hour? Would you believe it? Using CEREC, our practice can assess your needs and have custom-crafted porcelain crowns, inlays, and onlays created and placed in just one quick and easy visit. CEREC uses digital impressions sent to an in-house milling machine to turn a block of porcelain into beautiful porcelain crowns. Harnessing CAD/CAM (computer-aided designed/manufacturing) technology in this way makes for precise measurements and removes the need for messy impressions. Of course, the best thing about CEREC One-Hour crowns is probably that they can be done in one visit. In the past, porcelain crowns required a minimum of two visits with time in between for assessment, creation, and placement. Now, CEREC crowns give you more flexibility and a choice that fits in with your busy schedule. If you have a damaged tooth that needs to be fixed, you can now do it faster and better than ever. 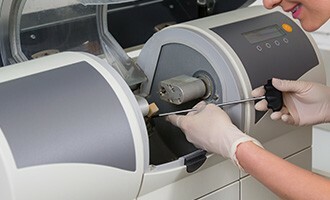 With CEREC, we can give you the best of everything in just a fraction of the time. To schedule an appointment, simply contact us today.